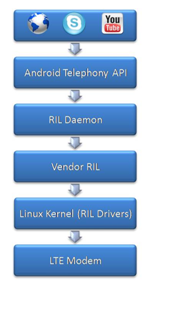 RIL Daemon is responsible for initializing Vendor RIL and forwards all requests from telephony framework to Vendor RIL. Vendor RIL communicates to modem protocol stacks via Hayes AT commands and forwards requests from modem to RIL Daemon or vice versa. Please see the figure above. Can we get the source code of Vendor RIL?? Okay, i am a newbie here so can we go to the basics and can you explain me the function of radio interface layer (RIL).